Garbage disposals have been around for nearly a hundred years, although it wasn't until after WWII that municipal sewage systems relaxed their regulations against food waste in the sewage systems and allowed the installation of disposals in home sinks. Plumbers in Greeley and other communities began to install and repair them for homeowners soon after that. These handy electrically powered units can be one of your kitchen's most useful tools, or, as any plumber in Greeley can attest, one of its biggest headaches if used improperly. Knowing how they work can help you to manage your disposal unit and add years to its life. The metal unit that you find installed between the sink drain and the pipe is powered by a high-torque, insulated induction electric motor. The motor powers a grinding chamber, where a rotating metal turntable catches food waste. Two swiveling metal impellers are mounted atop the plate. These metal fins throw the food waste against a grooved grind ring until the waste is ground small enough to pass through holes in the ring. At that point, it is flushed down the drain. But when you add rough and fibrous food, or try to overfill the grinding chamber, you can cause the unit to jam. Sometimes you can manually force the turntable to move again, or you can use a hex-key wrench inserted into the motor shaft to cause rotation. And of course, a fork or knife that accidentally slips into the grinding unit can both damage the disposal grinder and the cutlery. Still, the worst damage is caused by items like onion skins, shrimp shells or potato peels. Anything left in the disposal unit will grow bacteria and compromise the proper workings of disposal and drain. 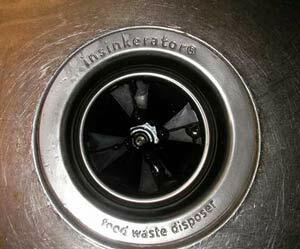 Garbage disposals don't use a lot of energy: with only 500-1500 Watts used each time you use the disposal. (That's about 3-4 kWh of electricity per household per year.) Water usage averages about the same as one additional toilet flush daily. Cleaning you garbage disposal not only helps keep your kitchen smelling better, it helps your sink drain work properly. Be sure, first, to put down the disposal only things that will grind easily. If something slips down accidentally (and it will happen! ), be sure to remove it as soon as possible. If the debris in your disposal unit has it jammed solid, you may need to call a plumber to clear it and check for any permanent damage. If you feel you must try and do it yourself, be sure to turn the power off at the breaker, because accidents DO happen, and that is the only way to be absolutely sure the grinding unit will not suddenly begin to spin. 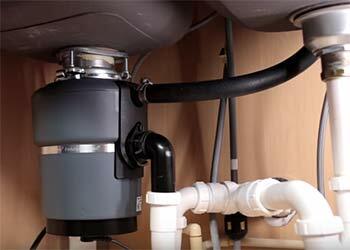 You can help keep things flowing by purging the drain line leading from the garbage disposal. Periodically, plug your sink drain, fill the sink with up to 4 inches of water, and remove the plug. Turn on the disposal unit and let it pull the water through the drain pipe. Some disposals stop turning when they sense a power overload. Let the unit cool off for a few minutes, then look for the reset button on the underside of the unit. Run cold water, press the reset button and try again. Still not working? Then it's time to call a pro. Sometimes food matter clogs not only the disposal but the drain below. If drain cleaner will not open the clog, it's time to call the plumber. We've all seen the sitcoms where the homeowner is under the sink, being sprayed with gallons of water from the drain and pipe he was sure he could repair on his own. While very handy folks can sometimes make these repairs themselves, it really is best to bring in a professional. Handy hint: once every few days, put a small handful of citrus peels into the disposal and run them with a lot of cold water. Your kitchen will smell fresh and the disposal unit will be deodorized. Ready to install a disposal unit, or need a new one? Give us a call. We can help you find one to fit your needs and your budget.